On Broadway, Eileen played Luisa Contini in Tommy Tune’s Tony Award winning musical, NINE. She also starred as Vi Moore in the national tour of FOOTLOOSE. She was recently seen as Florence Foster Jenkins in ICT’s production of GLORIOUS! She played the mother in the Ovation Award winning Havok Theatre Company’s production of KISS OF THE SPIDER WOMAN. Some of her favorite regional theatre roles include Aldonza in MAN OF LA MANCHA, Lucille in NO, NO, NANETTE, Julie in SHOW BOAT, and Nancy in OLIVER! Eileen performed the role of Fosca in MTG’s West Coast premiere of Stephen Sondheim’s PASSION, for which she won a Robby Award. She appeared in RADIO GALS at the Pasadena Playhouse and won a Drama- Logue Award for her role in that production as well as for her role in THE BEST LITTLE WHOREHOUSE IN TEXAS. Other California appearances include Billy Barnes’ MOVIE STAR, QUEEN OF THE STARDUST BALLROOM with Tyne Daly, and Judith Viorst’s LOVE AND SHRIMP, which also played at The Ballroom in New York with Bonnie Franklin and Mariette Hartley. She starred in Amanda McBroom’s HEARTBEATS, enjoyed a long run in Neil Simon’s RUMORS, opposite Bernie Kopel and was in the West Coast premiere of Stephen Sondheim’s PUTTING IT TOGETHER and THE YOUNG MAN FROM ATLANTA. 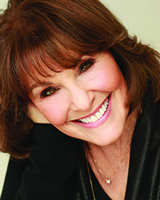 Eileen has recorded her cabaret act on her CD, “Eileen Barnett, Live at The Cinegrill.” Her recording for children, “Broadway With A Beat,” won a NAPPA Award (National Parenting Publications Award). She lives in Los Angeles with her five dogs, one cat and wonderful husband, actor Bruce French.